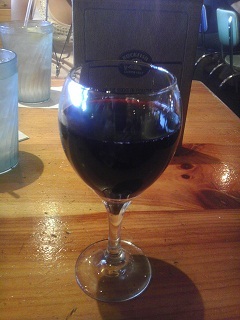 Here is another red wine we picked up from Franzia.... It's their Chillable Red! Not a bad wine for the price - 5 liters for $12.00. Red Wine Wino easily rated this one as a Good! White Wine Wino followed in kind. A little light on the alcohol content for a red wine (9.0% on the box). Regardless, do try it when you get a chance. 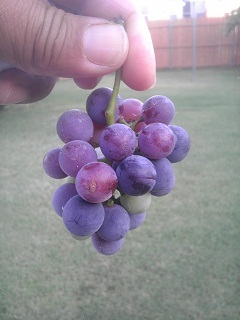 Started a Grape Vine in the garden last year. Looks like it made it through the heat last summer and may even make it again this year. Too bad, the White Wine Wino chose to pick one way too early... oh well, gonna keep on watering it and hopefully it continues to grow! Had a hankering for seafood last night. Ordered food and their House Red Wine. Not bad, not bad,... too bad that we forgot the name of it. Sounded something like "Twisted...." Oh well, will have to remember it next time we dine in! 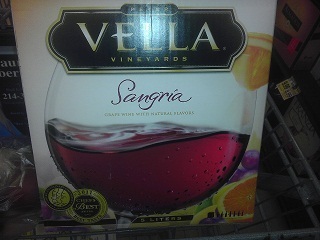 Here is another "wine in a box" from Peter Vella Vineyard's. It is their Sangria. Both Winos agreed to buy this one again. Earns a "Good Rating"! Right price, strong in spirit, and a great thirst quencher for the hot Summer!